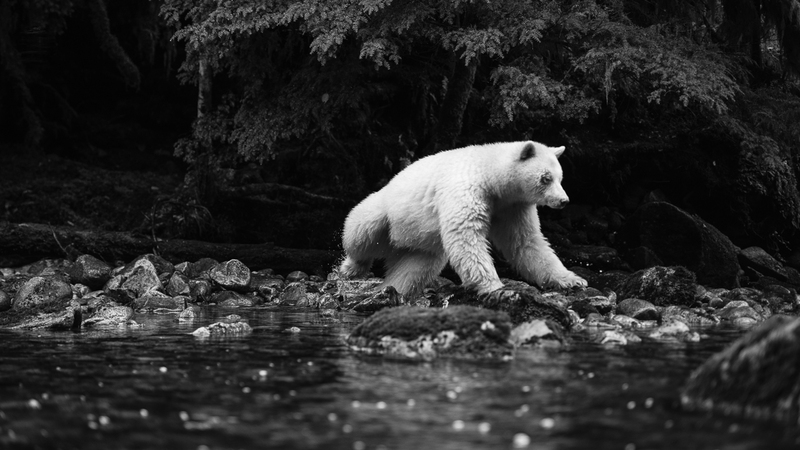 There’s a patch of land on the coast of British Columbia that’s become known as the Great Bear Rainforest. Humpback whales make these waters their home, rising from the black water to throw their breath into the fog before diving again, their massive flukes, crusted with barnacles, seem to wave goodbye as they do. The labyrinthine islands, low, shaggy emerald mountains, meet the water with a ring of grey rock, an inter-tidal zone home to yellow kelp, anemones, and sea stars. In these forests, the cedars bearded with low-draping moss, are a bear found only here. 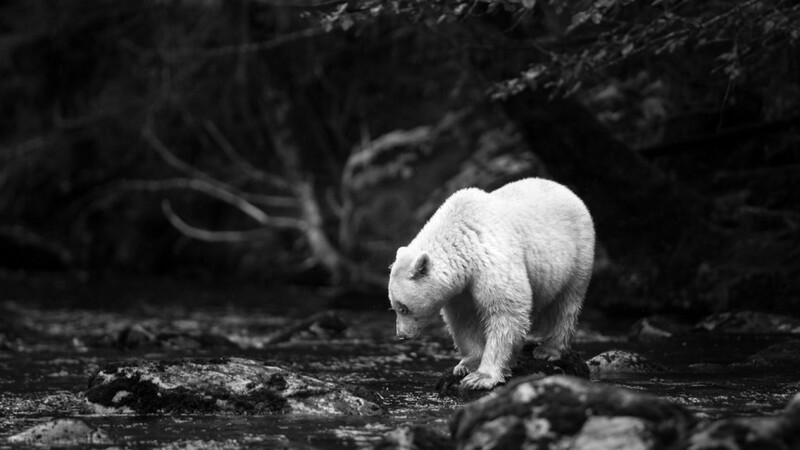 The Spirit Bear, or Kermode bear, are a white black bear. They are not albinos; they have black eyes and noses. Go a hundred miles from here and you won’t see one. I have wanted to see one for as long as I can remember knowing about them. 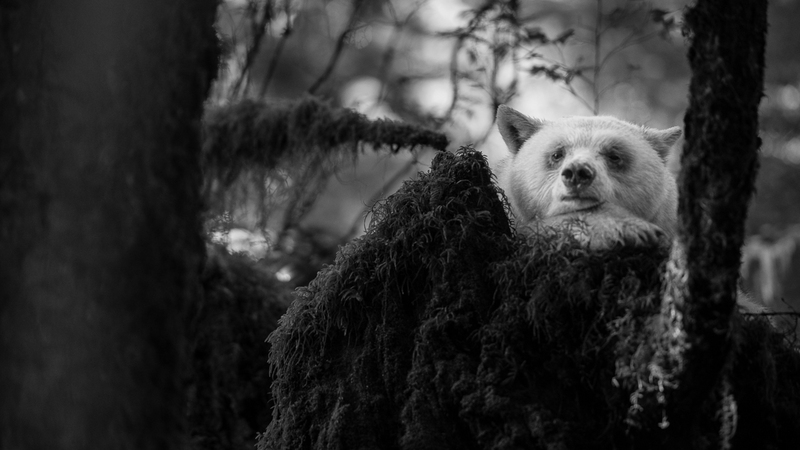 Last week I joined friends for a week in the Great Bear Rainforest, hiking up creeks swollen with relentless rain, and sitting for hours in front of dripping tripods and camera gear waiting for the white bears to come to feed on the remaining salmon, weak and dying after the fall run. When they came, and they did, along with many black bears, they came silently. 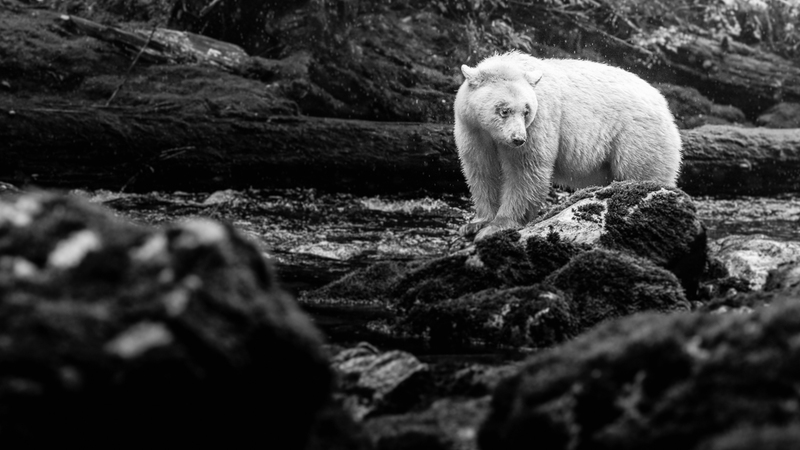 One moment you’re sitting there in their absence, sure they will never come, wondering if they exist at all, and then there she is: a white bear moving silently towards you, padding over the moss. I’m not sure I can quite describe the feeling of being with these bears, of being so close. But close isn’t the point. Intimacy is. It’s this feeling of being given permission, by the bears, to be there, and to share in the moment. I’ve had that feeling before in shrines and temples around the world, the feeling of being somewhere sacred and full of mystery. I guess we all respond differently to mystery, the unknown, and being faced with something so much larger than ourselves. Some with wonder, some with fear. Some with an instinct to “get the shot.” My initial awe tends to slow my response time. I prefer to experience the moment first. Like Sean Penn’s character in The Secret Life of Walter Mitty, I feel like sometimes the camera gets in the way. Sometimes the shot isn’t the point at all. It would be too easy to anthropomorphize these bears, but it would be a shame not to recognize them fully for what they are. They are not human but that doesn’t make them any less. There’s a consciousness and emotional state of being in all animals, and that allows for intimacy, if not complete understanding. Ask anyone who’s spent time in the water with whales or dolphins. Ask anyone who’s ever loved, and been loved by, their dog. 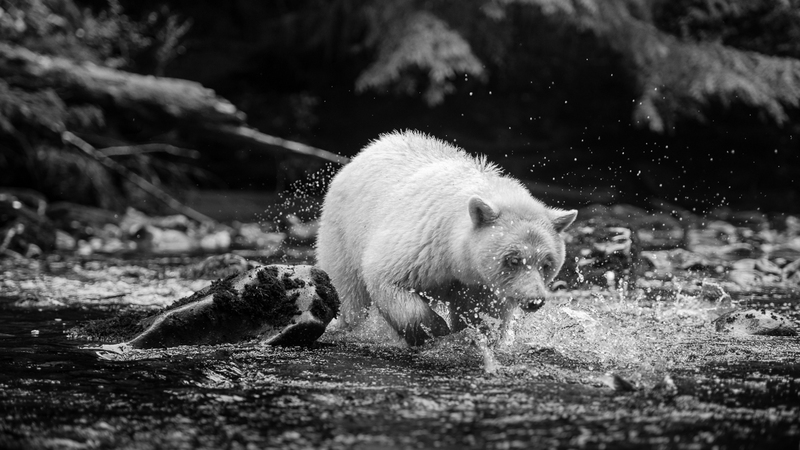 The bear we spent most of our time with is a gentle, beautiful animal. She is also fast and powerful. Sitting (respectfully and safely) with bears, as I have for the last couple years, makes me feel a part of creation – frees me not to feel separate from it, frees me from the once-held belief that we occupy the top rung. I feel in my proper place here in this beauty. The nature of life seems clearer to me here. This area is right now threatened by our need to move and sell oil and gas, and while I don’t question the need for some of these resources, I question the greed that drives us closer and closer to piloting massive tankers through some of the most treacherous navigable waters in the world, waters haunted by the ghostly wrecks of hundreds of ships. 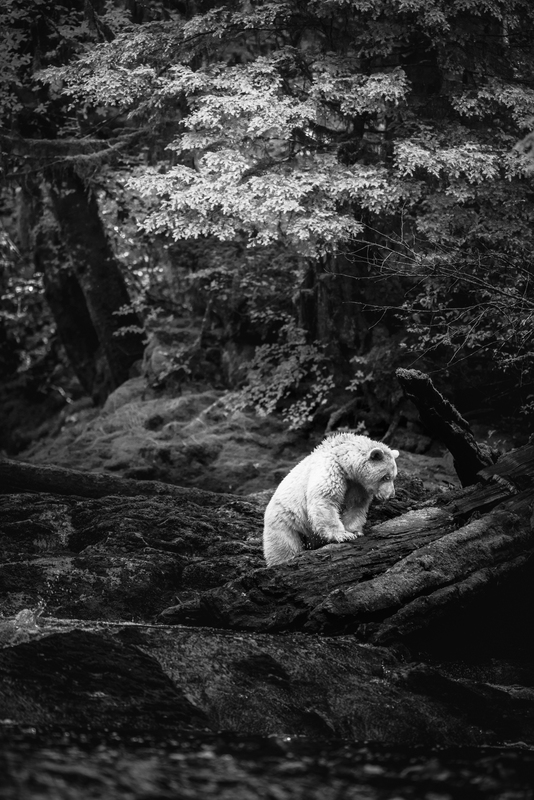 I wonder what will happen to this piece of the planet – currently the largest remaining uninterrupted stretch of temperate rain forest in the world – and to the entire ecosystem when the first hull is pierced and thousands of gallons of oil spills. What will happen to the bears, and the eagles, to the whales and to the families who’ve lived off this land for hundreds of years? These questions all simmer under the surface for me. It seems like the greatest beauty is the most fragile and vulnerable. I’m not sure my photographs will change things. I wish they could and still try to protect the hope that I once had that they can. But these experiences and the photographs I’m making can change, and have changed, me. Paul Theroux once wrote that “where there is wilderness there is hope.” I’m clinging to that. You can see more from this trip now and over the coming week on my Instagram page. There’s also some footage and more photographs on Episode 20 of Vision Is Better, which I just posted. Wow David, those photographs are magical – they certainly sing to me. I remember spending time with friends in Juneau Alaska amongst black bears. I was fortunate to be with some very knowledgable individuals who safely and respectfully introduced me to these wonderful animals. Some were so close that I can still smell that wet-dog/vinegar/rotten egg smell of their coats as they emerged from the creek. It was an experience I will never forget. Thanks for sharing your story. I hope the best for this area. Thank you for sharing these photographs. I had never heard of this area, and I had definitely never heard of the Spirit Bear. How incredible. Beautiful words and images, David… I needed tht today. Thanks. I can only wish. One day. So high on my wish…. She is beautiful, as are your words. Thank you for sharing your photos and your thoughts. Both so beautiful and moving. Being there must have felt like a spiritual experience. I hope the Great Bear Rain Forest can remain untouched and these creatures can keep roaming those woods as the ghosts they are often described as. 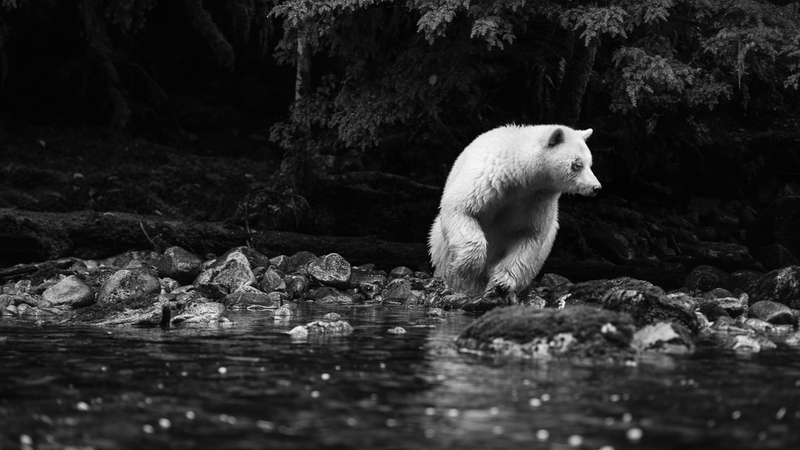 I’m very intrigued by these bears ever since I first saw Paul Nicklen’s images of them for Nat Geo. They always come across as pensive and gentile in photographs and I see those traits again in your photographs above. Somedays they are on the top of my photographic bucket list, other times like you said, I feel like I want to just meet them and a camera would only get in the way. Beautiful black and white rendering by the way. I’ve never seen that done before but it makes very much sense when you see the result. Extraordinarily beautiful set of photos. I just adore the bear(s) in these photos. Very interesting and sad to read about the oil/gas business threatening the rainforest. I think we as a species are way too greedy and should really stop and think about the earth and the diminishing nature around us. Hope the worst fears wont come to pass. OK…. the photo with the bear peering over the tree stump is magnificent. They all are ………F’n wow! I got chills as I read your adventures…..I felt I was there with you. Many years ago I was fortunate to travel to the west end of Vancouver Island- Pacific Rim National Park, Tofino….. as well as hiking in the rain…..camping…. and waiting out storms- so your description of your sitting and waiting- and waiting- and being there!…… brought back incredible memories I had when I was in your beautiful neck of the woods. Thank you David. Thank you, John. I head to Tofino for a short assignment as soon as I get home. Love it there! Extraordinary photographs and moving words. I happen to be one who believes that images and poetry can change the world. Thank you, David! Damn… my eyes started leaking while I read this… It is a difficult thing to explain something well enough that you affect somone almost as deeply as the actual experience of being there. Looking at your photos and reading your words I truly felt what you were attempting to convey. It touched me deeply and inspired me greatly. I have followed your work for many years now and appreciate your thoughts and angle on photography. For this I thank you. Kind of you to say, Simon, thank you. Beautiful photos and story telling, David! Thank you for introducing me through your stunning images and words to this beautiful part of the world and the magnificent spirit bears. You paint with both words and pixels, David. Both are exquisite! David, the mama bear searching for food is beautiful. So is the bear peering over the moss-covered rocks. It’s neat to watch your explorations of nature and the animal kingdom. Most of your print books line my bookshelves and have been read multiple times each. I’m looking forward to seeing more from your underwater travels and these trips you’re taking to visit bears, seals, whales and other animals who live near the coast. Thank you for sharing your beautiful photographs and voice. Thank you for that, Mark. There is something magical about these images. The look on the bear’s face is haunting too. Thanks for sharing. Wonderful blog post and beautiful photos. I have just booked a trip to see Kermode bears for this September. I shoot a Nikon D750 and am looking at renting a telephoto. I currently have a 70-200mm 2.8 but I would think I need a better zoom. Can you please give me some recommendations and advice on what gear to bring? Thank you.